But Vespasian and Titus Did Not Die And Rome Did Not Fall in A.D. 70? Recall in Dan 2:35 all four metals of the statue representing the succession of empires that conquered Israel from Babylon to Rome were “SHATTERED AT THE SAME TIME” when the rock struck the feet of the statue at the parousia in A.D. 70 though Babylon, Medo-Perisa, Greece and Rome each fell in a geopolitical manner at vastly DIFFERENT times. The fact that all four kingdoms fell at once implies that the fall of these four kingdoms is somehow SPIRITUAL corresponding with the SPIRITUAL reign of the church; the rock that grew into a mountain, the kingdom of God–a spiritual kingdom: “The coming of the kingdom of God is not something that can be observed, nor will people say, ‘Here it is,’ or ‘There it is,’ because the kingdom of God is in your midst.”1 (Lk 17:20-21) The same spiritual fall mentioned in Dan 2 is also signified in Dan 7:11 when the “beast was slain and its body destroyed and thrown into the fire” at the time in which the kingdom of God (a spiritual kingdom) begins its reign: “‘But the court will sit, and his [the beast’s] power will be taken away and completely destroyed forever. Then the sovereignty, power and greatness of all the kingdoms under heaven will be handed over to the holy people of the Most High. His kingdom will be an everlasting kingdom, and all rulers will worship and obey him.’ (Dan 7:26-27) This same event is predicted in 2 Th 2:8 “And then the lawless one [the beast who rises out of the Abyss] will be revealed, whom the Lord Jesus will OVERTHROW with the breath of his mouth and DESTROY by the splendor of his coming.” The lawless one is the beast who rises out of the abyss, Rome embodied by the Caesars of the Flavian Dynasty. Rev 19:20 also predicts the death and overthrow of the revived Roman Empire and its two figureheads: “But the BEAST was captured, and with it the FALSE PROPHET who had performed the signs on its behalf…The two of them were THROWN ALIVE INTO THE FIERY LAKE OF BURNING SULFUR.” EVERY one of these vs. concerns the SPIRITUAL fall of Rome (the BEAST) at the institution of the SPIRITUAL REIGN OF THE KINGDOM OF GOD. After the rock hits the statue all 4 parts of the statue shatter “ALL AT THE SAME TIME.” (Dan 2:35) This cannot represent the fall of Rome as the other 3 empires did not fall at this time: Babylon fell in 539 B.C., Medo-Persia fell in the 5th century B.C., and Greece began its decline in 323 B.C. But what about the fact that Titus and Vespasian did not die until long after A.D. 70? In Revelation, the beast is repeatedly said to die and then rise from the Abyss, the realm of death (Rev 9; 11:7; 13:3; 17:8). Yet the beast dies with Nero, the head with the “fatal” wound, (Rev 13:3) and then rises out of the Abyss (death) with Vespasian. And though the Roman Empire teetered in civil war between the death of Nero and the rise of Vespasian, ROME NEVER ACTUALLY FELL at the time in which it was supposedly DEAD. If the beast (ROME) is then cast into the “lake of burning sulfur” (Abyss) AGAIN in Rev 19:20, why is this instance suddenly fulfilled in the EARTHLY FALL OF ROME? Similarly, if the earthly representative of the beast in Rev 19:20, Vespasian, and the false prophet, Titus, are said to RISE OUT OF THE ABYSS (Rev 9, 11:7; 17:8) and yet NEVER PHYSICALLY ROSE FROM THE DEAD, when both men are CAST BACK INTO THE ABYSS in Rev 19:20 should we NOW assume they must PHYSICALLY DIE in A.D. 70? Duncan McKenzie believed that the Antichrist and the Lawless One is ultimately a satanic spiritual power.2 It is this demonic ruler or rulers who is the Lawless One and the Antichrist and it is this angelic being or beings who is or are “overthrown” and “destroyed” (2 Thessalonians 2:8) at the Parousia, not the individual person or people they work through behind the scenes like Titus and Vespasian. 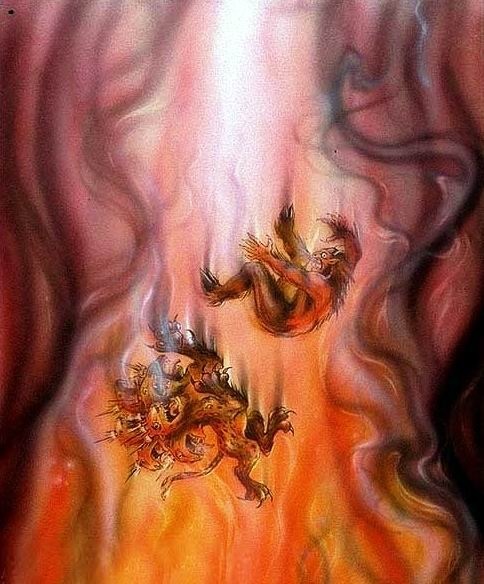 Revelation 16:13-14 reads, “Then I saw three impure SPIRITS that looked like frogs; come out of the mouth of the dragon, out of the mouth of the BEAST and out of the mouth of the FALSE PROPHET. They are DEMONIC SPIRITS that perform signs[. ]” I believe it is these two spirits behind the beast and the false prophet who are cast into Hades in A.D. 70. In Revelation 12:3-4 a red dragon (Satan) casts a third of the stars or angels out of heaven. This dragon then works through Herod and tries to kill the Messiah when He is born. Afterwards the dragon then manifests itself as the seven-headed sea beast of Revelation signifying Rome and its Caesars. In Revelation 13 Caesar/Rome is pictured as SATAN and his kingdom which is ALREADY depicted as a 7-headed dragon in HEAVEN in Revelation 12:3. The fact that Satan (the dragon) first manifests as Herod trying to kill the Messiah, then as Caesar (two different individuals) shows that there is ULTIMATELY A SPIRITUAL FORCE BEHIND THESE TWO DIFFERENT individuals. In Ezekiel 28 the king of Tyre is mentioned as if he were BOTH an ANGELIC KING and an HUMAN KING AT THE SAME TIME! In Ezekiel 28 the king of Tyre is said to be a “GUARDIAN CHERUB” (v. 14) who was blameless (v. 15) before he sinned and was expelled from God’s presence (v. 16) to the earth (v. 19) as if he were a fallen angel. The commander of the army of the Lord is an angel (Josh 5:13-15) called Michael in Rev 12:7. Here we see again how an angelic power is again behind and poetically fused with another human king. Daniel 8:9-11 cited above is especially worth mentioning as this is a prophecy concerning the little horn. Here we see that the little horn is truly a demonic being. And if the little horn of Daniel 8 is truly a demon, what does that imply concerning the little horn in Daniel 7. And if the little horn of Daniel 7 is said to be cast into the lake of fire in A.D. 70 (Daniel 7:11), does this not imply that it is this spiritual figure that is cast into the Abyss at this time? Must Titus, its human reflection or host, necessarily also die in A.D. 70? The fact that the destruction of the statue of Daniel 2 is a spiritual fall of a spiritual kingdom may also be implied by the fact that Rome is Babylon in Revelation. (It was only through her adulterous affair with Rome that Jerusalem becomes one-flesh with Rome and is also called Babylon (see Revelation 17: A Preterist Commentary).) The fact that both the head and feet (top and bottom) of the statue are both called the same thing, “Babylon,” may imply a kind of one-ness to this statue. The notion that the whole statue might be “Babylon” might also be implied just by the fact that the head of the statue is Babylon (Dan 2:38), a fact that appears to explain why the Church is called the Body of Christ since Christ is the head of the Church (Col. 1:18). 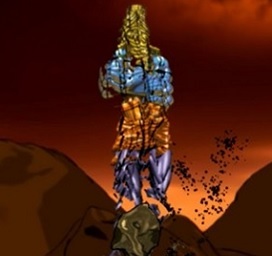 The idea that the whole statue of Dan 2 is a cohesive unit/singular spiritual kingdom is also implied when comparing the fourth beast of Dan 7 with the sea beast of Rev 13. The four beasts of Dan 7, of course, symbolize the same four empires represented by the four metals of the statue of Dan 2. The sea beast of Rev 13 is the fourth beast of Dan 7. According to Rev 13:2, this fourth beast is a chimera comprised of the three previous beasts of Dan 7 being part lion (Dan 7:4), bear (Dan 7:5), and leopard (Dan 7:6). I believe the fact that the fourth beast of Dan 7 is a chimera composed of a mixture of the other three beasts implies that the four beasts of Dan 7 and the four metals composing the statue of Dan 2 are really a cohesive spiritual kingdom. The fact that this statue is a spiritual kingdom ruled by Satan is also implied by the fact that the king of Babylon, the head of this statue, is conflated with Satan as if they were one and the same (Is 14:3-23). The same can be said concerning other kings who reigned throughout the time symbolized by the statue of Daniel 2 (Ez 28, Dan 8:9-11). The fact that these kings are likened to or spoken of as though they are Satan implies that the statue of Daniel 2 is truly a symbol of the spiritual reign of Satan on earth finally put to an end by the reign of Christ and His kingdom. The idea that the four empires of Dan 2 and 7 are a cohesive unit aligns well with the notion that these four kingdoms are a truly a cohesive spiritual kingdom whose fall corresponds with the institution of another spiritual kingdom, the kingdom of God. Duncan W. McKenzie, Ph.D., The Antichrist and the Second Coming: A Preterist Examination Volume 1: Daniel and 2 Thessalonians (USA: Xulon Press, 2009); Duncan W. McKenzie, PH.D., The Antichrist and the Second Coming: A Preterist Examination, vol. II (United States: Xulon Press, 2012). The Sibylline Oracles 3.63-74; Ascension of Isaiah 4:1-14. Ralph P. Martin and Lynn Allan Losie, gen. eds., Word Biblical Commentary, vol. 52B, Revelation 6-16, by David E. Aune (Grand Rapids: Zondervan, 1998), 535, 739. The beast begins to show signs of life in December of A.D. 69 at the coronation of Vespasian and the start of the Flavian Dynasty and rises from the dead at the fall of Jerusalem in A.D. 70 when the last pocket of resistance was crushed. The beast cannot be cast into the Abyss at the fall of Jerusalem in A.D. 70 if that is precisely when the beast rises out of the Abyss. It is more plausible that the beast dies at the end of the Flavian Dynasty at the death of Domitian since the beast originally died at the end of the Caesar Dynasty at the death of Nero. Remember the beast is Rome under its two first century dynasties. Once the Flavian Dynasty ends, the beast is cast back into the Abyss. This view also makes better sense of the millennium. The fall of Jerusalem in A.D. 70 is 1001 years before the conquest of Palestine by the Seljuk Turks in A.D. 1071. Furthermore, the Crusades began in A.D. 1095 which is 999 years after the death of Domitian in A.D. 96. This makes sense of the fact that the Crusades began in A.D. 1095 since the Messianic/Thousand-Year Reign cannot begin until the beast is cast into the Abyss and this did not happen until A.D. 1096 when the Flavian Dynasty ended.